The Eppendorf minispin plus microcentrifuge is designed to fit into the smallest space on the lab bench for comfortable reach and delivers high speeds and dependable use. This micro centrifuge is commonly found in Academia and blood testing labs and is ideal for startup biotech companies looking to save money on quality equipment. The Eppendorf minispin is easy to use and comes with rotor. This compact benchtop microcentrifuge is small enough to keep at hand, but at <52dBa it wont be a distraction to you or those around you. 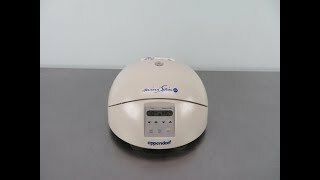 This personal centrifuge has a max speed of 14500 RPM and a Max RCF of 1400 x g. The Eppendorf minispin plus microcentrifuge features a built in timeer that will last between 15 seconds and 99 minutes, with a pulse feature or continuous operation. Dimensions 10 x 10 x 10"
This Eppendorf mini spin plus microcentrifuge has been fully inspected and is preforming to expectations. All of our lab equipment comes backed with our standard warranty. Should you have any questions, please don't hesitate to contact us.